When she was 10, Talia Leman motivated other kids to trick-or-treat for Hurricane Katrina donations. Now the Roosevelt and Central Academy senior has her own nonprofit, RandomKid. In fact, her organization has now raised more than $10 million to support efforts ranging from disaster relief to clean water projects to building new schools. 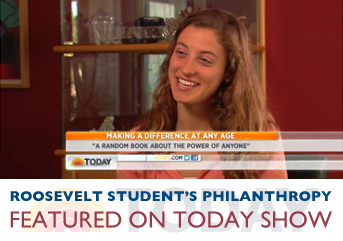 On Friday, October 5 Talia appeared on NBC’s Today Show to talk about what inspires her philanthropic work. She also talked about new book, “A Random Book About the Power of ANYone,” about not only her efforts but also on how everyone can make a positive difference. According to Talia’s mom Dana, the latest Amazon ratings show the book is the #1 bestseller on volunteerism, #3 in the self-esteem category, and #6 in motivational.